Two words – polar vortex. Yeah, I didn’t know it was a real thing either until it hit hard and shut down Chicago along with most of the country. We Chicagoans can withstand most weather conditions, but the below freezing double digits temps are just brutal. On cold, wintery days like these, there’s nothing more comforting than a hot bowl of soup. No, not the canned stuff with the red label, but fresh, homemade soup. Trust me, it’s way easier than you think! 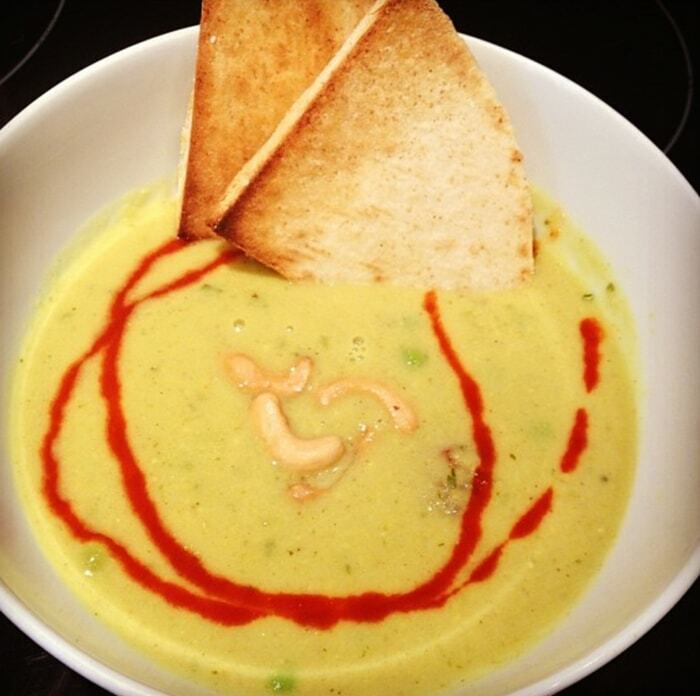 One of my favorite soups this season is Curried Cauliflower with Roasted Peas and Potatoes. I stumbled across this variation of cauliflower soup and enhanced it with even more vegetables and some additional flavors. Traditionally, when we think of cauliflower soup, it’s the creamed version. However, charged with new resolutions, many of us are looking for healthy alternatives. This soup is full of vegetables to keep you immune system strong. And healthy doesn’t mean that you have to sacrifice flavor, so I’ve added cilantro crème fraiche and sriracha to complement the curry. Pita bread toast points make for an easy and hearty one bowl meal. 1. Put the cashews in a blender and blend until finely ground. Add 3/4 cup water and blend for 2 minutes. Pour the almond mixture through a fine-mesh strainer into a bowl, pressing on the solids with the back of a spoon. Discard the solids. 3. Once potatoes are done, transfer to a bowl and set aside. 5. In a large pot, heat the olive oil over low heat. Add the onion and sauté until golden. Add the cauliflower, coconut milk, strained cashew milk, almonds, curry powder, tumeric, cumin, sugar, cinnamon, and salt as needed. Add enough water to cover. Bring to a low boil, reduce the heat, and simmer until the cauliflower is tender, about 10 minutes. 6. Blend the soup with an immersion blender until the desired consistency is reached. If using a standing blender, allow the mixture to cool for 20 minutes. Pour the soup into the blender. Hold the lid down firmly with a clean, folded towel over it. Start on low speed and blend until the soup is smooth. Return to the pot and reheat if serving hot. Add potatoes to the soup. Add peas right before you serve so they stay nice and bright green. 7. Ladle into bowls and garnish with caramelized onion, cashews, sriracha and cilantro before serving.